The past two weekends were the annual Parade of Homes put on by the Tallahassee Builders Assn and it’s been our Mother’s Day tradition to take Mom out for browsing the homes and then to dinner. We were a week later than usual due to a sudden uptick in our social calendar, but this Sunday we trekked out to see about half of the 27 homes in this year’s showcase. Now, in previous years there has been an element of ‘someday,’ a bit of aspiration to our browsing, but this year–with Mom having recently purchased property and us having just closed on the Dollhouse–I wondered if we’d actually have any fun with it. Drowning in a sea of grey at this year’s Parade of Homes. I’ll be so glad when this trend exhausts itself! But a few more houses in and we found some with a more varied palette and my spirits lifted accordingly. Part of it is, I think, that we’ve been immersing ourselves in house and home decor ideas since the chance of acquiring the Dollhouse became a reality that I’m less impressed by the trends as I feel like I’ve seen a lot of them between the blogs and magazines I’ve been consuming at a rapid pace. That said, there’s definitely something different about seeing particular details in person versus on-screen, and this gave Todd and I the chance to discuss certain treatments and get the ball rolling on some ideas for our own home. 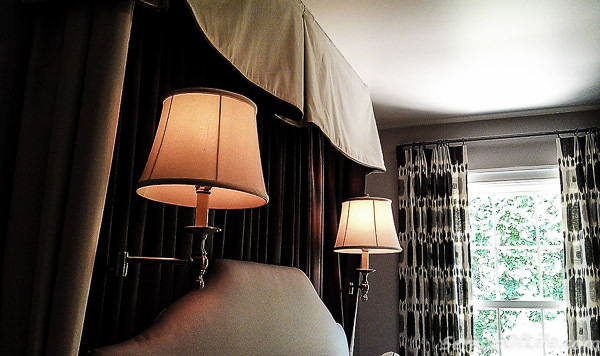 Padded headboard, lush drapes, and wall-mounted reading lamps. One of the first ones we came across was this corniced and draped canopy(?) behind the headboard in the master bedroom. I’ve told Todd several times I want wall-mounted reading lamps for either side of the bed, but when I’d shown him similar pictures of this sort of set-up he wasn’t really enthusiastic. Once he saw it in person? Much more on-board with the idea! And with the 10′ 6″ ceilings in the Dollhouse we can do a lovely treatment at top to really make it special. Most of our attention was directed at kitchens, though. This is not surprising as it’s almost certain that our kitchen will be the first room given a makeover once the contractor is through with his to-do list. 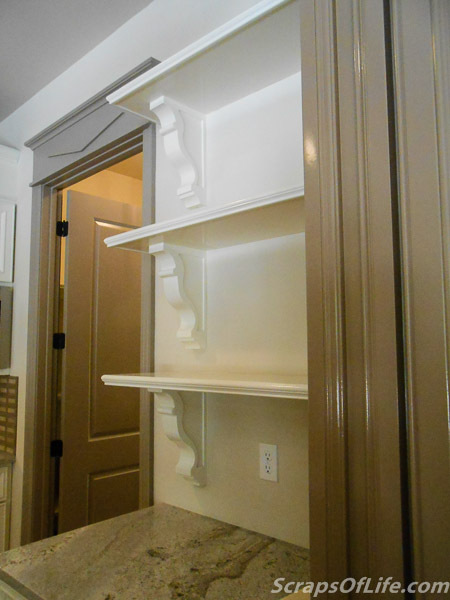 Open shelving with decorative brackets or corbels. 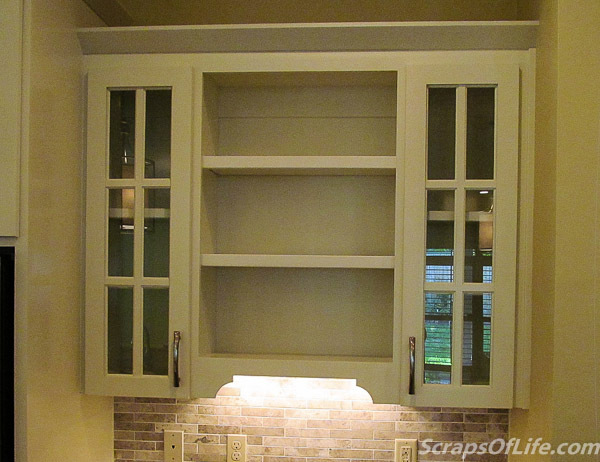 Open shelves bookended by glass-front cabinets. I’ve already said my first act will be to remove all the horrible upper closet doors in the kitchen and leave them off until we decide just what to replace them with. Todd was concerned, for a bit, that I meant to leave them that way–open–but that’s not the plan. I’m no more a fan of completely open shelving than he is, but I’m also not opposed to judicious use. After seeing the decorative brackets/corbels in the top photo he decided that some floating shelvesÂ isn’t necessarily a bad idea, and even like the open shelving in the next photo, as well. Again, it was just a matter of seeing things in person and in a space to bring about an agreement. A tidy kitchen with excellent cabinetry. 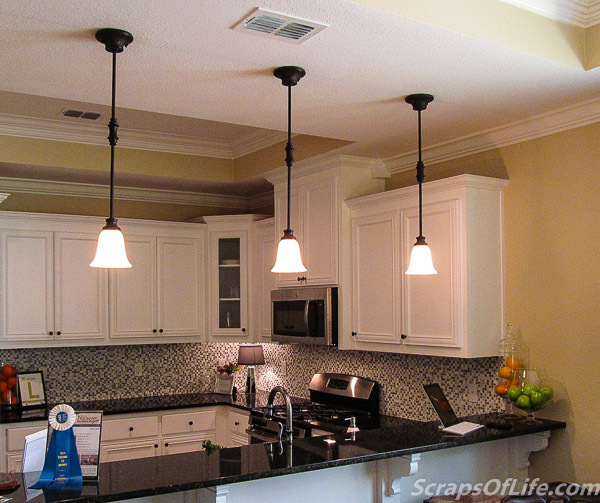 While I definitely want some of our cabinets to reach to the 10′ kitchen ceiling to maximize storage space, I’m certainly open to some cabinets ending short of the ceiling if they’re topped with pretty crown molding and, perhaps, some uplighting for maximum effect. We did spend some time up at the Dollhouse this past weekend, as well. It was nice to see the progress that the contractor was making (new roof, some of the flooring being updated, and even the taller-than-I-am window in the upstairs bathroom opens, now!) and give another shot to getting the hot water to work. Not to spoil the suspense for next week’s post (once I’ve had a chance to edit and upload the video), but we’re not there yet. Le sigh. Other things were accomplished, though, so it certainly wasn’t a wasted trip! Determining the best sushi in town is at the local supermarket (Publix)–neither of the two Chinese places we’ve tried so far have impressed us much, and the third we walked out of when we realized it was more like a fast-food place than the Japanese steakhouse the sign suggested. Oh, well, it’s probably for the best, and it’s not like Tallahassee is too far when we get the craving for good sushi. We’re definitely going to need a water purifier for the house–we drink far too much water to go strictly bottled and the local water in Thomasville is not pleasant on its own. During one of our two trips to Lowes we checked out the options between simple under-sink filters, reverse-osmosis systems, and whole-house filters as well. It’ll need to be addressed by the time we move in, that’s for certain. Both Todd and I had this weird feeling about seeing evidence of “strangers” inÂ our house while we weren’t there. I mean, obviously we asked for the work crew to be in there but to come in and find things very much changed was still disconcerting. Currently we’re trying to complete the first draw request so that the work can continue. It hit a few bumps (is anyone surprised?) but hopefully we’re ironed out the kinks in the process. More on that next week, as I don’t want to tell this tale before I’m sure of the ending!